Ujung Kulon National Park contains the largest remaining lowland rainforest in Java and is also one of only two homes of the critically endangered Javan Rhinoceros. The park is located at the western-most tip of Java. 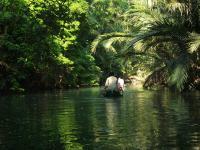 The area is covered with lowland rainforest, swamps, mangroves and grasslands. The peninsula has coral islands and coral reefs. The National Park includes the volcanic island group of Krakatoa and other islands including Panaitan, Handeuleum and Peucang on the Sunda Strait. 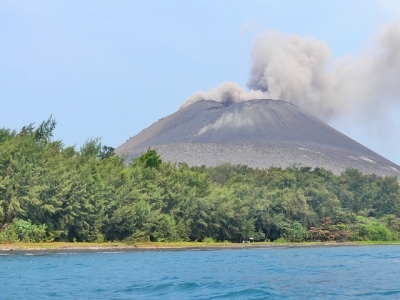 Krakatoa is part of the Pacific Ring of Fire. It suffered a major eruption in 1883, when the combined effects of pyroclastic flows, volcanic ashes, and tsunamis had disastrous results in the region. The official death toll recorded by the Dutch authorities was 36,417, although some sources put the estimate at more than 120,000. I visited this WHS in August 2018. Ujung Kulon National Park is located at the westernmost tip of Java as its name suggests (Ujung Kulon actually means Western Point) and it is made up of Ujung Kulon peninsula low rainforests (home of the last remaining Java rhino) and the volcanic island groups and nature reserves of Krakatoa, Panaitan, Peucang and Honje in the Sunda Strait between the islands of Java and Sumatra. I visited Krakatoa or Krakatau Nature Reserve as a long private day trip from Jakarta and it turned out to be by far the most dangerous and exhilarating WHS visits so far for a number of reasons. First of all after having booked online well in advance, hell seemed to break loose just before visiting Indonesia with very strong and devastating earthquakes and tsunami alerts all over the country but mostly near Lombok. On top of that, Anak Krakatau or the Child of Krakatau, a volcanic island which emerged from under the sea in 1927 from the caldera formed by the terrible 1883 eruption of Krakatau (which killed more than 30,000 people), got more active than usual and from June till September, molten lava eruptions took place almost on a daily basis with incandescent gases and ash coming out intermittently with occasional 'ballistic rocks' spewing out of the volcano and landing all over the island. For this reason, we were almost certain that the trip would be cancelled as it involved climbing Anak Krakatau for a closer look. After calling a couple of days before to reconfirm, we were told that the trip was still confirmed and that it was up to us. We decided to go for it and surely enough at around 04:30 we were picked up from our hotel in Jakarta. By 07:30, after stopping for breakfast at Carita Beach, we met our captain and crew who were supposed to take us to Anak Krakatau in roughly 1.5hrs with a twin-motor boat. The captain warned us that it would be hard to reach the volcanic island group as the winds were blowing against us and the sea was treachorous to say the least with big swells and high waves initially marked as force 3. The worst thing about the boat trip was that the volcanic group was only visible after more than 1.5hrs of 'wave surfing' and what seemed like never-ending bumps. Even though I'm not usually afraid of rough sea trips, I seriously was considering asking the crew to take us back and call it a day. The small fishing boat trip to Skellig Michael a few years back was what I always mentioned with friends as being one hell of a ride but as the weather report marked force 6-7 seas and we sped from one high wave to the next trying to reach Krakatau, the trip to Skellig Michael felt like a piece of cake compared to this! My better half started to feed the fish, which in itself was already an indication of how bad our situation was as she never threw up in her life before, and at that moment just before I was going to tell the crew to head back, I saw a dark column of thick smoke spouting out of the horizon and going high up into the skies! We had almost reached Krakatau Nature Reserve at long last. As we sought refuge from the strong winds by heading between Rakata and Anak Krakatau, we witnessed molten lava reaching the seashore and causing white fumaroles of water vapour, ash and gas eruptions from the two vents or craters were occuring every 15-30mins and every now and then rocks were fired in the air and landing on different areas of the upper part of the island. 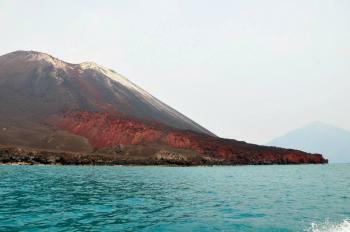 The other side of Anak Krakatau, away from Rakata, has vegetation (photo) and a black sandy beach. Usually here there is a ranger on duty who takes over and continues the 'tour' upwards as close (and safe) as possible to the summit. Due to the significant volcanic activity taking place when we visited, there was no ranger on duty and it seems we were the only crazy people willing to risk our lives to get here and explore. There is a board with the UNESCO inscription information just behind the beach. The most important safety advice given by our guide was to keep on the lookout for any big rocks catapulted in the sky towards our direction and NOT to run away backwards or forwards, but keep looking at its trajectory and simply move sideways before it reaches land. Judging by some of the burnt or still burning trees and by the size of some the heavier and larger volcanic rocks lying around with circular moon-like circumferences around them, our construction hats were definitely not enough to protect us. Luckily the only rocks that fell were small and quite far from were we climbed apart from a medium-sized lightweight pumice which reached the beach and now lies on my desk as a souvenir from Krakatau Nature Reserve. Out of the many crevices covered with ash, several ferns, bushes and flowers are growing all over the island and it really felt like a privilege to visit such an extraordinary place in the making (especially when other similar places on the list like Surtsey are off-limits). After climbing down to the beach and collecting my souvenir which thankfully was a pumice not an igneous rock, I preferred not risking it further and asked our crew to prepare lunch opposite Anak Krakatau at a reasonable safety distance on Rakata's black sandy beach. The vegetation on Rakata is much older and bird life and reptiles are thriving. We quietly ate our lunch, gazing at Anak Krakatau erupting and we could feel the beach vibrating beneath us although the vibrations weren't as strong as the ones we felt when setting foot on Anak Krakatau's beach. After that we spent some time snorkelling on the other side of Rakata where supposedly there are two underwater volcanoes. There were several colourful fish but nothing special at least for snorkelling. It's more of a unique experience to swim over two marine volcanoes and two continental tectonic plates subducting under or over each other. Even though I'm not a fan of volcanoes becoming WHS simply because each volcano is unique in some way or another, this particular volcanic group really felt special. Reading more about Krakatau in Simon Winchester's book Krakatoa: The Day the World Exploded I could appreciate further its OUV. The fact that such a special place is just a small part of the huge Ujung Kulon National Park in itself reinforces its OUV and protection and conservation for those who want tangible proof of how insignificant man can be when compared to the power of nature. Despite many trips to Indonesia, I only have seen Jakarta and really wanted to visit this country’s World Heritage Sites especially the nearest one from the chaotic capital, the Ujung Kulon National Park. The inscribed area covered two separate sites, one is the Ujung Kulon National Park which is famous for its mangrove forest and the last place to see the endangered Javanese rhinoceros in the southwest of highly populated Java Island. The other site is the group of volcanic islands of Krakatoa in the middle of Sunda Strait and belong to Bandar Lampung, a city on Sumatra Island. I really wanted to visit Krakatoa since I heard the name of this volcano since my elementary school time, its 1883 eruption story is very well known especially for the Dutch. In October I visited Jakarta again and successfully managed a one day trip to Krakatoa with the tour company. After some research I found that Krakatoa receives steady amount of visitors every day and most of the tour companies are the same. The tour driver picked me up at hotel in Jakarta at 6 AM, and drove thru congested morning traffic on the highway to Cilegon before use a small seaside road to the beach town of Carita. The journey was about 2.5 hours, the time I arrived in Carita, I was really hungry. After met tour company manager to make payment, they provided me a breakfast at a restaurant. After meal at 9.30 AM, they took me to the jetty where I met captain, his assistant and my tour guide, and the double engines boat. The sea journey took another 2 hours on surprisingly calm sea. After saw four dauphins near the boat, I started to see the Krakatoa at the horizon releasing smoke from its crater. It was much smaller than Sakurajima I saw at the beginning of the year, but the location in the middle of the sea is really awe inspiring. In fact Krakatoa at present is a group of 4 small islands which are the remains of the 1883 old volcano and its nearby islands. In the center is the new volcano called Anak Krakatoa or Child of Krakatoa. This volcano is very active and is expanding. At first the captain took me to see the biggest island of Rakata which was the main vent of the 1883 eruption, the high cliff show evidence of explosion. The island is covered by lush tropical forest, a really amazing of how nature can transform the danger volcano to green paradise. Then I went to Anak Krakatoa. The boat moored at the only beach of the island, the beach is blackish with volcanic sand, and behind the sea is the small forest. When my feet was out of the sea, I immediately felt the unusual heat of sand. The ranger office, the camping area and the toilet are located in the same area on the beach. The toilet water is really warm that reminded me a nice hot spring in Japan. My guide took me thru the forest, the soil was indeed hot and I really surprised how those trees can survive. I entered into the main volcano area, the soil are reddish and full with gigantic sulphuric rocks. I walked pass death trees and many big rocks. The soil become a hot sand when we started to climb the volcano. It was very hot by the sun and the heat underground. Then I saw the sea of black volcanic rocks, the cold lava flow and the volcano that continuously releasing the fumes. My guide took me to the highest point that authority recommended to go. From here the view of Sunda Strait and surrounding island were just beautiful and rewarding for hot climbing. After some volcanic explanation and eruption stories, we walked back down to the beach for late lunch, the Indonesian most famous fried rice, Nasi Goreng. Later I swam in the sea, the cold water helped me a lot after long hot hiking; however, the tiny black volcanic sand covered all my body and it was really hard to clean. I also did some snorkeling to see some fine coral reef. It is really stunning to find coral reef on the sea bed that is actually the growing volcano. Then we sailed around the Anak Krakatoa to see the island expansion by the cold lava flow. Except the small forest area where I landed before, the whole island is almost lifeless with only red and black rock, but I could see many small bushes and shrubs dotting around in the area next to the sea, the nature is doing her best to turn the red dry volcanic island to green tropical paradise again. After 4 hours of luck that no eruption during visit, the captain turn the boat backed to Carita ending the fantastic Krakatoa trip. When I landed Carita and saw all the beach resorts and hotels as well as many small villages with densely population, I could not stop thinking that all this area was once devastated by the 1883 tsunami and what will happen again in the future as the Krakatoa is coming back again. Anyway Krakatoa is indeed amazing and very easy to visit since the volcano is still not too high and there is almost no rules to restrict the volcano sightseeing, actually you can go anyway you want on the island if you are willing to climb and walk on the sharp hot volcanic rocks with good equipment. The continued progresses of thermal and gas explosion as well as volcano forming are really interesting and at least should be seen once in the life time and Krakatoa is one of the nicest to do. For trip preparation I recommended a nice walking shoe with good ventilation, don’t buy fancy expensive one since the hot sand and sharp rocks will later make your shoe deform. Another suggestion will be long sleeves rash vests to protect UV and really useful for swimming and snorkeling later. If I back to Indonesia and have more time in Jakarta area, I will revisit this place but for the Ujung Kulon peninsular for sure. Anyway even visit only Krakatoa, this World Heritage Site is really amazing and one of the most unique experience in Southeast Asia. Ujung Kulon National Park is one of many Indonesian Beauty. Yet, it takes quite an effort to get there, thus make the park has not been visited as often as it should be. There are many ways of actually embracing it. Island Hopping, trekking, canoeing & snorkling in and around those small islands. Not to mention spending the night in a simple lodging and have to bring or prepare our own food while there. Although it is said that the park is the home of the one-horned rhinoceros, but it is not easy to find and see one. Yet many other inhabitants are very easy to find and see. Ujung Kulon experience is really a great one! Ujung Kulon is Fantastic! You wouldn't get enough of it in spite the fact that you had everything in it : Rainforest, Corals, Mesmerizing Seaview, vast of biological diversity. All. You name it. Just back from Ujung Kulon yesterday and my feet's still soaring but my heart is still pounding with happiness. I may didn't go on it's best condition this late December. It's raining every now and then, I hardly get the sunset which supposed to be spectacular. Please come at mid-year, when the weather is quite pleasant. I went all the places by boat and trekking. Get a bus or drive from Jakarta to Desa Sumur. From Desa Sumur get a 3 hours boat trip to Laban. On the way you could see TamanJaya village, the very west village on Java Island. From Laban go across the rainforest to Pos Karang Ranjang. 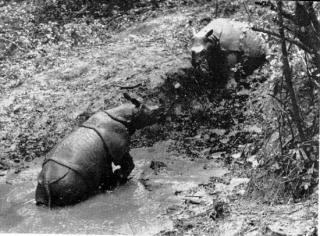 On rainy season the track might be hellish : thick mud and water to your knees all the way. On dry season it'd be FINE I believe. From Pos Karang Ranjang go further to Cibondawoh beach through another Rainforest. Cibondawoh Beach is astounding with it's high tides,blue water, and pearly beach. That's the end of day 1. The next day, prepare for a long journey on the seaside. 13 km walking on the seaside from Cibondawoh to Cikeusik. and go further to Pos Cibunar through rocks, rainforest and plain green grass fields. the view along the way is astounding.totally amazing. at Cibunar, you could go snorkeling or have a bath at Cibunar river. Go further through the great rainforest to Pos Cidaon, where you could see wild bulls on its vast grass field. Further is the primadona of Ujung Kulon : Peucang Island. Have a 1/2 boat trip from Cidaun, and go snorkel at Peucang. You could see quite great corals with its varies kinds of fishes. Though it may not as good as Lombok's or Bunaken, it offers great sites for snorkeling after long walk through Rainforest. Luckily though it was raining but at the time I landed at Peucang the sun is shining--great for snorkeling, though, temporarily. Peucang Island can also be reached easily by boat from Carita or Labuan. But Trekking was helluva experience, I'm telling you. Peucang is our last resort. We went back to Labuan, Desa Sumur by long boat trip--in quite a storm. We then go back to Jakarta, and me, further to Bandung, where I come from. Must Bring Items : Camera! with wide and long zoom, Snorkeling equipment, swimsuit, raincoat, rainforest equipment, binoculars, medicines, bugs repellent and use a good mountain sandals. Mine's broken into pieces yesterday. Hit by Tsunami: 1883 Krakatoa; 2018 tsunami: could have been caused by undersea landslides after Anak Krakatau volcano erupted. Covered by volcanic ash: Half the park was destroyed in the eruption of Mount Krakatoa in 1883. Coral: "The rich coral reefs of the Ujung Kulon coast are dominated by a small number of species that make up some 90% of the coral mass"
Turtles and tortoises: "Green turtle is known to nest within the park"
Captain James Cook: "Captain James Cook is known to have anchored HMS Endeavour on the south-eastern side of Panaitan Island from 6-16 January 1771."